The Duigan Centenary of Flight - 2010 replica aircraft has been handed over to the Australian National Aviation Museum to join its "Australian Made" collection for ongoing public display following its 12 month celebrations of the Duigan Centenary year which included static display at Mia Mia in July 1910, taxiing displays at Ballarat in January 2011 and ground running displays at Avalon Airshow in March 2011, along with displays on the Geelong foreshore and at Geelong College. 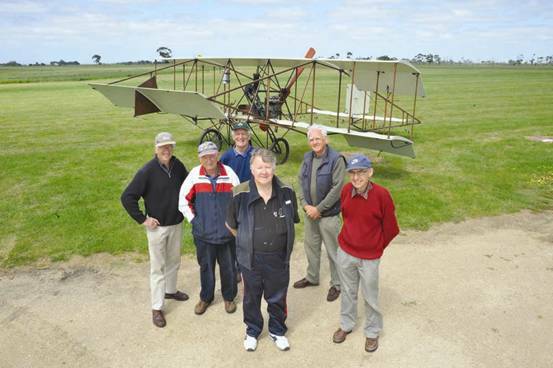 The Centenary of the first Australian made aeroplane to fly in 1910, the Duigan aeroplane, was celebrated in July, 2010, at Mia Mia, Victoria, the district where the plane was built and the early flights took place. Other aeroplanes were flown in Australia in 1909 and 1910, all of oversea's design and construction. An imported Wright machine from the USA was flown briefly, by Colin Defries in Sydney on December 9th, 1909. Other European aircraft also arrived including an imported Bleriot, flown by Fred Custance in Adelaide on 17th March, 1910 and the most notable of these, an imported Voisin, which was flown by Harry Houdini at Digger’s Rest on March 21st, 1910. However all of these flights had been made in aircraft built commercially overseas, of types well proven to fly successfully in the hands of others, and two most successful flights todate were undertaken by overseas pilots with overseas flying training and experience, and there was no reason why these flights should not have been successful, and why some of these efforts were not well regarded then, or now. Despite the arrival in 1909 of these overseas aircraft, and various attempted or successful flights in various locations through early 1910 there was an even more impressive effort being developed by two local Australian brothers without any access to commercially built aircraft or formal flying experience or training. The Duigan brothers undertook their development privately on a family property in Victoria, and across 1909 undertook tethered tests with a home built glider loosely based on a Wright glider form. John Duigan, a trained engineer based his developments on the writings and calculations of the UK scientest Hiram Maxim, and photographs sent from overseas. Following his glider tests he commenced design and construction of a powered aircraft, loosely based on a Farman form becoming the 1910 Duigan pusher biplane being locally designed by John Duigan, and constructed by John and his brother Reg. This aircraft, constructed of Australian components including a motor designed and built in Melbourne, was subjected to rigorous testing by Duigan before any attempt at flight. His first short flight of 24 feet was achieved on 16 July 1910 at the family property "Spring Plains", Mia Mia (between Kyneton and Heathcote, Victoria), was the first flight of an Australian designed and built aircraft. Interestingly there is no evidence that the Duigan brothers were aware of, or attended Diggers Rest in March 1910 to inspect the aircraft, or the flying attempts of Banks or Houdini?, and no reference to Duigan's work or intentions in the press of the day? However of all the prewar pioneers, the Duigan brothers work and achievements is the most documented and perhaps the significant in its accomplishments. Born in Terang Victoria in 1882, John Duigan had studied Electrical and Motor Engineering at Finsbury College in London and returned to Australia by 1908. The powered aircraft had been developed from experience learned by the brothers in building and testing a tethered glider at "Spring Plains" in 1908-09, a design similar to a 'Wright' layout. His powered aircraft design was however significantly different to his glider and more of similar layout to the French 'Farman' biplane. Duigan prepared his own plans and specifications, and in a large shed on the family property, constructed the frame of the plane from red pine and mountain ash. The aircraft was some 10 metres in length, with a wingspan of seven metres, was powered by a four-cylinder air cooled engine built by Tillaroo Motors to Duigan’s design. The Duigan pusher biplane went through a number of modifications to improve its performance including conversion of its engine to water cooling and a larger cylinder bore. A longer flight of about 100 yards was achieved on 30 September 1910 and again even further at 196 yards on 7 October 1910. It was of Australian design and construction as required by the government and, but for a misunderstanding by Duigan of the requirements of the Government & Aerial League competition, may well have qualified for the ₤5,000 on offer. In January 1911, Duigan demonstrated his plane to newspaper reporters at "Spring Plains", and the following April he made several public flights before a crowd of 1000 at the Bendigo Racecourse. John Duigan in 1912 travelled to England, to obtain his pilots licence, and commissioned a tractor biplane from A.V. Roe to his own specifications, known as the Avro-Duigan Biplane which he later sold. He returned to Australia and in 1913 built a second tractor biplane with his brother at Ivanhoe Victoria, using the ENV engine from the 1912 tractor biplane, and later joined the AFC and flew in combat in France. Duigan’s achievement is all the more remarkable for the fact that he had never seen or flown an aircraft previously and had little technical information with which to work. His first design was based on little more than a postcard of the Wright Flyer, and a copy of papers from Sir Hiram Maxim of the UK. With the exception of the engine and propeller, each component was made by Duigan and his brother in a rudimentary workshop on the farm, the aircraft made many flights and is now under the care of the Museum of Victoria. The Australian National Aviation Museum is proud to have supported this project to construct a flying replica of the Duigan Biplane as part of the centenary celebrations of the first Australian designed and built aircraft to fly. The museum provided website, fundraising and project support to the team who has concepted and commenced this replica project in 2008. Dr Gwynne Duigan, the project patron, Duigan family Archivist and Matriarch, accessed photographs and records from the Duigan Family Archives to allow the establishment of a specialist website to support the Replica construction and fundraising activities, while Terry Egan and a group of volunteers undertook many visits to view the original aircraft, now in storage in the Museum of Victoria in Melbourne, to undertake measurement and photographing of the original to allow drawings to be created. Dr Duigan was later joined by Proffessor David de Kretser A.C., then Governor of Victoria, as Chief Patron of the Duigan Centenary project. Terry Egan, who lives in Geelong, describes himself as a farm boy from Western Victoria. He retired from forty years of teaching Art, culminating as Head of Fine Arts at The Geelong College. After restoring and competing in Pre – War Classic cars, he obtained his Private Pilots Licence and helped to construct three R.A.Aus aircraft. While at Narromine, N.S.W., in 2007, he inspected the replica of the Wright Bros flyer and it was suggested to him that a replica of the John Duigan ‘s 1910 biplane be constructed to celebrate 100 years of flight in Australia.. Terry is associated with the Duigan family in Geelong and with their encouraging support, and the assistance of a team of aero – engineers and wood workers, has delivered this replica project in time for the Centenary celebrations and ongoing enjoyment by the public. The replica was commenced in the later half of 2008. Timber for the manufacture of the aircraft frame was donated by the Reid Bros. Main plane wing ribs, as well as Canard and horizontal stabilizer were all manufactured from red pine as was the original. All leading and trailing edges and the main fuselage longerons were manufactured from quarter-sawn mountain ash also as used on the original machine. The museum supplied a 1930s Henderson Heath 4 cylinder air cooled upright aero conversion of a motorbike engine from the USA to take the place of the original 4 cylinder water cooled Tilley engine.